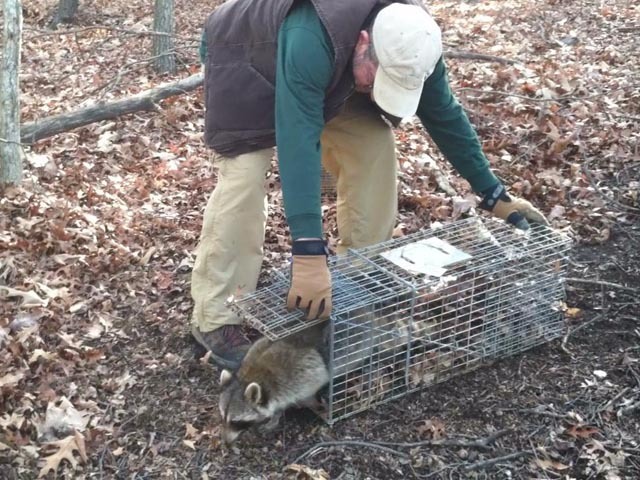 This article focuses on how to ensure live-catch traps work their best, both for resolving your situation and preventing, or at least minimizing, harm or stress for wildlife. Before attempting to trap any wild animal in or near your home, though, you need to check with your local humane society or state wildlife agency about pertinent laws for your area. Even more important—before resorting to obtaining a live-catch trap, such as one of the Havahart Traps, be sure you have tried other simpler approaches easily available to you. Sometimes a little patience and tolerance wins the day, solving your problem with little effort or expense. The animal in question may leave on either on her own, or—assuming dependent young are not present—you may be able to encourage her to do so with a little gentle harassment. When dependent young are involved, you’ll want to resolve the problem in a way that keeps the family from becoming separated. Otherwise, the young are sure to die, or your new repairs may be taken apart by a desperate wildlife mom trying to rescue her trapped babies. For specific recommendations, check out our articles about raccoons, foxes, squirrels, chimney swifts, house sparrows, starlings, snakes, flying squirrels, skunks, bats, woodchucks (groundhogs) and deer. More often than not, problems can be resolved without needing a humane live trap. 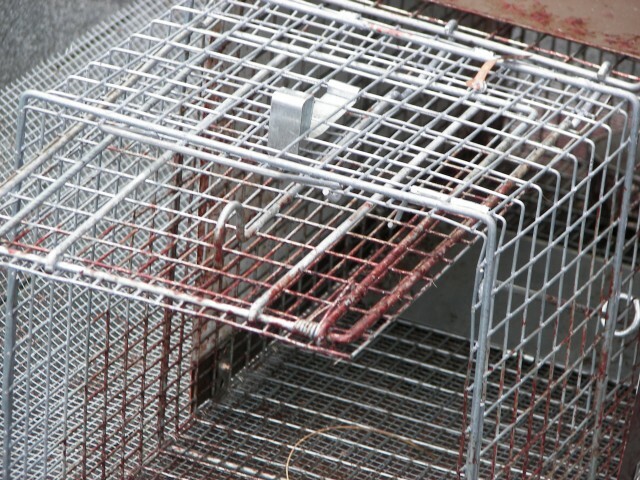 Once you have given other appropriate options a reasonable chance to work, if the problem has still not been resolved, you might consider buying or renting a live-catch trap. Live-catch traps —also known as box traps, cage-style traps, or humane live traps—enable you to safely remove an animal from your home. The animal should then be released on site, with follow-up work to seal entry points once it is certain that all animals are out. 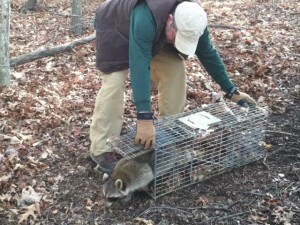 For most people, the best option if a live-catch trap ends up being needed is to hire a professional wildlife control company to handle the task. A well chosen company can save you time and money in the long-run, because of their experience. For example, rather than using a trap, a professional wildlife control expert can install a one-way door at the point of entry to gently evict the animal and then seal the area to prevent the animal from returning. This should go without saying, but in case anyone tries to misguide you—poisoning is always the wrong approach. It causes an exceptionally cruel death, is dangerous for people and pets, and often has the unintended consequence of a poisoned animal dying in an inaccessible place in your home. 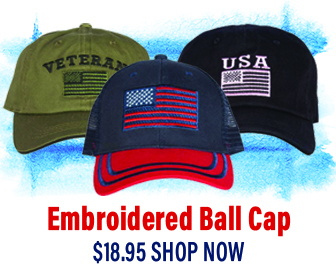 Reject this outdated and failed approach and use only non-lethal solutions. And if you opt to work with a wildlife control company, choose one that is committed to solving wildlife problems with humane methods, and to following up with commonsense steps to prevent recurrences. Several brands of live-catch live traps have a long record of safe, easy, and successful operation, including Tomahawk, Trucatch, and Havahart. They’re built to last for years and come in various types and sizes, as well as in both one-door and two-door styles. One-door works best for a larger animal, as the animal can walk farther inside the trap, so it is less likely to be able to back out after taking the bait. Two-door traps make small, cautious animals, such as squirrels, less frightened to enter, because they can see a clear path through the trap. Practice with the trap, so you will be able to open it easily when you need to do so. Know where you can humanely and legally deliver a trapped animal if the animal is sick or injured (local shelter, veterinarian, wildlife rehabilitator, clinic?). Keep in mind that you may catch—and need to quickly release—an unintended animal or a nursing wildlife mom who needs to return to her young. Know your state and local laws for traps before obtaining or setting one. Check with a local wildlife rehabilitator, cooperative extension service, or nature center to find out when wildlife in your area are likely to have dependent young. Refrain from setting a trap outside if temperatures are above 80 degrees F or below 35 degrees F, or when heavy storms are possible. Avoid setting a trap in direct sunlight or where flooding may occur. Asphalt roads, tar, and shingle or metal roofs are also going to be dangerously hot in summer. Only set a trap when you will be available to check on it every two hours, preferably, or, at a minimum early each morning and late in the evening. Ensure that nothing you plan to put inside the trap has any sharp edges that might injure a trapped animal while trying to free itself. Try to find a safe object that can be put in the trap for the animal to chew on to prevent chewing on the metal or wire—perhaps a chew toy or plastic water bottle. Have a light sheet or towel available to drape over the trap once the animal is trapped to reduce stress. Keep people and animals away once an animal is trapped. Assess what has attracted the animal to the undesired location so you can make adjustments to prevent attracting others. When catching rats, place traps along a wall near where they enter, and lean a board against the wall over the trap to provide cover that makes them feel safe. When evicting squirrels, close off most outside entrances and place humane live traps at both attic and basement openings. Outdoor humane live traps should be placed along outer walls or fences, where animals are most likely to travel. Place a little bait outside the trap so the animal follows the trail inside. Place bait on top of the trigger plate, underneath it, and above it—either smeared on or attached to the trap ceiling. For traps outdoors, dig a hole for the bait below the trap just beyond the trigger plate. Allow the animal a few days to become accustomed to the trap’s presence before setting it. Prop the door(s) open with wire or a stick. Once the bait has been taken, begin setting the trap. 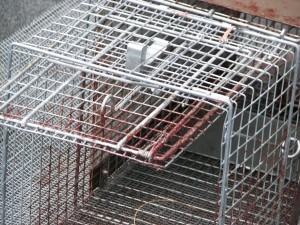 To be sure the trap will work correctly, spring it a few times by touching the trip plate on each end. Camouflage an outdoor trap with vegetation. Try springing the trap again to be sure nothing prevents it from closing. Check the trap often, at least every two hours during the day so trapped animals don’t become harmed or stressed while trying to escape, nor harmed by exposure to extreme temperatures. Animals should be released on site, as relocation typically separates families or results in death of the animal when it finds itself in unfamiliar territory. Once an animal is removed from your home, ensure no others are present, and close up or repair the entry points that allowed access. If you’ve caught a skunk, approach the trap slowly with a sheet or cloth large enough to cover the trap. Hold it so that the skunk cannot see any part of you as you approach, and gently drape the cloth over the trap. This should help calm the skunk so you can carry the trap without being sprayed. After each use of a trap, wash and disinfect it with a bleach solution of 1 part bleach to 9 parts of water for 20 minutes, and then rinse thoroughly.